Andrew just returned from Pakistan's National Defence University where he was lecturing on the geostrategic significance of the China-Pakistan Economic Corridor, and he's eager to share his insight with Sputnik's readers. The world order is going through profound changes in transitioning from the Western-controlled unipolar system to the non-Western model of multipolarity, and the ongoing multifaceted friction between the opposing forces sums up the nature of the New Cold War. The US and its allies are struggling to retain their erstwhile dominance over global affairs, while Russia, China, and their respective partners are working hard to achieve peaceful breakthroughs in undermining their rivals' control. 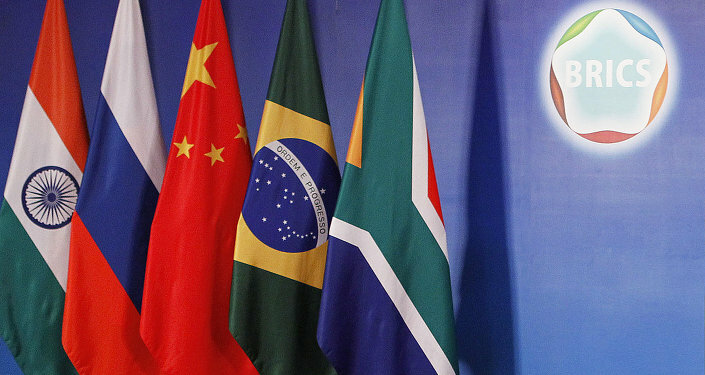 The development of alternative governance systems such as BRICS, the Shanghai Cooperation Organization (SCO), and the Asian Infrastructure Investment Bank (AIIB) are central to the multipolar initiatives to reform the world system, but what's needed most of all is to integrate the Afro-Eurasian countries of the Eastern Hemisphere into a win-win network of real-sector economic relations. China's solution to this pressing need is its One Belt, One Road (OBOR) global vision of New Silk Road connectivity which aims to construct a series of multipolar transnational connective infrastructure projects designed to do just that. The most important Silk Road project is the China-Pakistan Economic Corridor (CPEC), which is a $55 billion investment (and counting) that seeks to connect East Asia with South Asia by means of a non-Malacca mainland trade passage. Upon full completion, CPEC will be a geopolitical game-changer for the simple reason that it will provide China with an alternative to the South China Sea and Strait of Malacca, thereby making it impossible for the troublesome US Navy to control the People's Republic's trade routes via maritime manipulations in these two aforementioned chokepoints. This, in turn, will allow China to trade more freely with its Western European, Mideast, and African partners and therefore advance its globally transformative vision of New Silk Road connectivity which lies at the heart of structurally reforming the unipolar-controlled global system. While China is indeed streamlining other mainland corridors across Eurasia and plans to outfit them with high-speed rail technology, they each run the risk of being disrupted, controlled, or influenced by the externally provoked identity-driven conflicts of Hybrid Wars. The same can be said for CPEC, too, but it's much easier to manage these disturbances in the two transit states of China and Pakistan than it is to do so all across the Eurasian landmass. This makes CPEC the most solid and dependable New Silk Road investment from a security standpoint, which is doubly understandable if one acknowledges the geostrategic seriousness of this project. CPEC doesn't just connect China to the Indian Ocean, but also lays the groundwork for Pakistan to function as the Zipper of Eurasia in linking together a series of Eurasian economic blocs. As I explained in my September 2015 analysis for the Russian Institute of Strategic Studies, CPEC holds the promise of "zipping" the Russian-led Eurasian Economic Union, China, Iran, and South Asia Association for Regional Cooperation (SAARC)-member Pakistan together in economically strengthening the SCO and subsequently enhancing the viability of the emerging Multipolar World Order. Accepting that CPEC holds the realistic possibility of connecting Europe, the Arab countries, and Africa with their SCO counterparts, then it's foreseeable that a Convergence of Civilizations will take place on Pakistani territory which could consequently counter the divide-and-rule blueprint of a "Clash of Civilizations." Cognizant of the irreplaceable significance of the Indian Ocean and appreciating the dual roles that CPEC is poised to play as the Zipper of Eurasia and Convergence of Civilizations, it’s reasonable to assert that the present century is an Indo-Pacific one and that Pakistan sits right in the middle of the most influential global processes. None of the abovementioned concepts – the Zipper of Eurasia, Convergence of Civilizations, and Indo-Pacific Century – are hyperbolic slogans, however, as there's solid economic reasoning behind each one. To succinctly explain, the expansion of transport connectivity generally equates to an improvement in economic relations between all related parties which come to employ the said route, which thereby justifies the Zipper of Eurasia paradigm. Concerning the Convergence of Civilizations, any company could be interested in relocating their production facilities to Pakistan in order to achieve equidistance between their pan-Eastern Hemispheric suppliers and consumers, as well as to cut down on related transport and labor costs. and East Asia, as well as to in principle acquire access to SAARC (provided that political-administrative roadblocks can be surmounted). CPEC is also importantly located midway between the booming East African marketplace and China's East Asian manufacturing coast, so it can additionally be utilized by either of these sides or interested third-party partners to facilitate trade between this emerging economic axis. Altogether, the crisscrossing trade networks in the Indian Ocean and CPEC's central location in enabling all of this adds credence to the argument that the world is moving towards an Indo-Pacific Century which will see South Asia become the focal point of global geopolitics and economic competition. Having acquired familiarity with the driving logic behind CPEC and its salience to the New Cold War, it's now time to introduce the reader to how this game-changing project is slated to contribute to the bolstering of the BRICS bloc and the consequent promotion of the emerging Multipolar World Order. Chief economist with the Eurasian Development Bank and Programme Director of the Valdai Discussion Club Yaroslav Lissovolik published a thought-provoking policy proposal in February titled "Re-Thinking The BRICS: On The Concepts Of BRICS+ and BRICS++," in which he elaborated on the most feasible prospects for broadening the five-member BRICS partnerships into a truly global multipolar platform. Soon thereafter, China proposed its own concept of "BRICS-Plus" which it vaguely alluded to as being composed of key OBOR partners, thereby strongly inferring that Pakistan and CPEC (the largest Silk Road investment) would naturally be involved. This immediately drew the ire of India, which has been steadfastly opposed to CPEC on the grounds that it allegedly violates New Delhi's maximalist claims to Kashmir. I comprehensively explored the various nuances involved with this in an article that I published for the Islamabad-based Regional Rapport analytical outlet titled "India's Freaking Out Over China's 'BRICS-Plus' Proposal," and I suggest that any curious readers reference it if they'd like to learn more about this important issue. The topic of India's resistance to this project isn't the focus of the given article, nor is its rapidly developing military-strategic partnership with the US which might be playing a guiding role in these said calculations, so I'll move along and continue to discuss the positive aspects related to CPEC instead. China's OBOR vision of global New Silk Road connectivity recently received official UNSC backing in mid-March, and this has set the stage for Beijing's upcoming Belt and Road Initiative summit (BRI, another name for OBOR) next month which will be attended by dozens of world leaders including President Putin. India and the US, in what may either be coincidence or coordination, both have yet to signal their interest in participating, which might thus mean that they're voluntarily isolating themselves by choosing to remain outside of this new global economic framework. Either way, China and its multitude of partners won't be dissuaded from continuing their breakneck progress on OBOR just because two spoilsports are against this series of initiatives, and there's a strong likelihood that Beijing will make the New Silk Road and BRICS+ concepts the tangible manifestations of the four themes that the People's Republic plans to promote during the 9th BRICS Summit which it will host this September. Accordingly, there's no escaping the fact that CPEC is primed to steal the show in such a scenario due to its previously explained geostrategic significance, so it's fair to state that this New Silk Road project will form the inseparable spine of BRICS+ and thenceforth the future of the multipolar world. This makes it all the more curious why more people aren't up to speed about CPEC and its pertinence in catalyzing the global transition from unipolarity to multipolarity, but this lack of awareness can likely be attributable to the ongoing infowar campaign being waged by China and Pakistan's rivals and which is designed to suppress any objective information about this ambitious undertaking. Nevertheless, China seems ready to bring CPEC to the forefront of the world's mainstream attention during the upcoming BRI and BRICS Summits, at which time this project is expected to be debuted as the cornerstone of the equitable and just alternative world system that China and its partners are constructing. In every which way, the future of the multipolar world depends on CPEC, and given the strong global support that this initiative is receiving, it's safe to say that the future lies in good hands.